Dementia in parkinsonism is caused by a variety of central nervous system (CNS) lesions, of which the molecular and pathogenic causes are poorly understood but probably include: 1. Degeneration of subcortical ascending systems with neuronal losses in dopaminergic, noradrenergic, serotonergic, cholinergic or multiple systems including the amygdyloid nucleus; 2. limbic and/or cortical Alzheimer and/or Lewy body pathologies, with loss of synapses and neurons, and 3. a combination of these lesions or additional CNS pathologies. In general, degeneration of subcortical neuronal networks appears insufficient to induce severe mental decline although, occasionally, cognitive impairment occurs without apparent cortical lesions. On the other hand, neuritic cortical Alzheimer change showing similar or differential distribution compared to Alzheimer’s disease (AD) displays a significant linear correlation with dementia in Parkinsonism. Plaques can be associated with cortical Lewy bodies and, the contribution of each to dementing processes remains unresolved. In a consecutive autopsy series of 610 patients with parkinsonism, the total prevalence of retrospectively assessed dementia was 34.6%. In Parkinson’s disease (PD) of the Lewy body type, it was 30.2%, mostly associated with other brain lesions, mainly AD, while only 3.5% of “pure” PD without additional brain pathologies were demented. There was no significant difference in age and duration of illness between demented and non-demented PD patients. 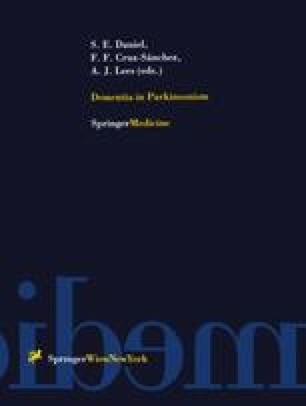 Secondary parkinsonian syndromes showed a higher incidence of dementia (56.3%), again with predominant Alzheimer pathology which was present in 73% of the total of demented parkinsonian patients and in almost 82% of the demented PD cases in this series. The specific contribution of cortical and subcortical lesions to mental impairment in parkinsonism, their relationship to AD, and an etiology await further elucidation.